ALWAYS – keep your knife in a sheath and when wearing it on your belt. Keep it well back on your thigh so it will not interfere when sitting or kneeling. ALWAYS – clean and dry your knife after every use. A safe way is to lay the knife blade on a flat surface and wipe one side then the other. Soaking knives in water or in a sink damages the wooden handles and could prove dangerous hidden under suds. Boiled linseed oil applied to dried burl wood and horn handles helps their appearance. ALWAYS – Keep your knife sharp as a dull knife can be more dangerous to use. Every knife needs sharpening from time to time and after years of cutting all knives need to be reground either by us or someone experienced. Your butcher may suggest someone. ALWAYS – keep your carbon steel and Damascus outdoor knives clean, dried and oiled to prevent rusting. ALWAYS – take care to fully open sheaths before removing knife to prevent cutting the sheath and occasionally oil the leather to keep it pliable if you wish. ALWAYS – keep your knives stored safely and out of reach of small children and teach your family how to use and respect knives. Safety begins first at home. The number one thing to remember is each knife has been designed for a different purpose. 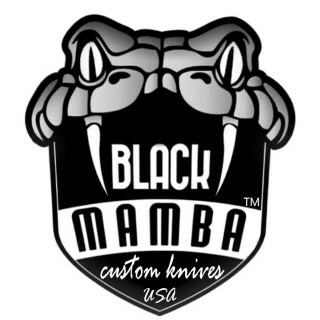 Black mamba Knives are made with high quality materials to bring you a fine cutting tool. Our steels are ideal for edge retention and ease of sharpening. The high carbon content of our steel allows our stainless Kitchen & Outdoor knives to maintain a sharp edge without rusting. Dishwashers, outside of damaging wooden handles, also dull blades faster than normal use because of the hitting action against other cutlery, etc. during wash cycles. We suggest a sharpening steel or ceramic sharpener to keep kitchen knives their best and use a wet stone to sharpen your black mamba outdoor & pocket knives. Tung oil or boiled Linseed oil applied to dried burl wood handles helps their appearance. Care should be taken to insert/remove knives straight and fully open sheaths before removing the knife. This prevents cutting of the sheath. Sheaths that are cut or damaged are not covered by warranty, only sheaths with manufacturer’s defects, ie stitching or riveting. Also, the leather may be oiled occasionally to keep it pliable with Neet’s oil or a good quality leather conditioner oil. REMEMBER to be good to your BLACK MAMA KNIVES and you will have a fine product that will serve you long and well!